From Earth to the edge of the universe, UC Santa Cruz makes giant impacts in astronomy, astrophysics, and planetary science. We are pioneering new technologies for giant telescopes, adaptive optics, and gamma-ray astrophysics; discovering planets beyond our solar system and the most distant galaxies in the universe; and reshaping paradigms in cosmology, astrophysics, and particle physics. From NASA missions to the UC Observatories, we help people see what has never been seen before. 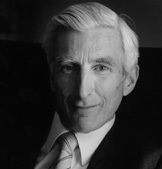 Astronomer Royal, Martin Rees From quasars to black holes, Martin Rees is at the center of astronomical research.